Editor’s Note: This article was written by Devon Metz, fiancee of EDB writer Allan Wright. As a dietitian, who eats a mostly plant-based diet, I am thrilled to welcome a new vegan establishment to town. To be honest, I am perplexed that Boulder, a mecca for health-conscious people, has a dearth of plant-based restaurants. Most people know that colorful fruits, vegetables, and grains are loaded with vitamins, minerals, and antioxidants, but many local restaurants continue to serve giant slabs of animal protein with scant amounts of veggies. 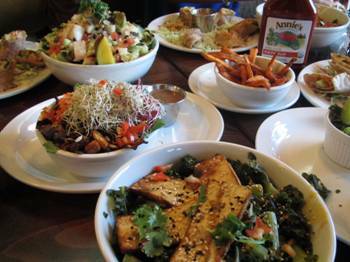 The colorful, chef-crafted cuisine at Native Foods makes a dietitian proud. All menu items are made from scratch and most are teeming with nutrients. I, along with three meat-eating friends, had an opportunity to sample Chef Tanya’s menu at Native’s Boulder pre-opening party, and we were not disappointed. Native Foods is not just for vegans. General Manger Steve Shenk affirmed that only 25% of their patrons are vegan, so the majority of their customers are simply choosing to include more plant-based foods in their diet. The fast-casual, counter-service café features an eclectic menu with items inspired by cuisines of the world. 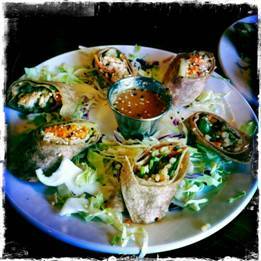 Whether you’re craving Mexican, Italian, Moroccan, Greek, Thai, or Japanese, you’ll find something to whet your appetite. Of the four starters and entrees that we sampled, the Saigon roll, filled with lemongrass tofu, daikon, carrot, cucumber, cilantro, basil, and brown rice, served with peanut sauce, was the unanimous favorite. Native’s peanut sauce is spot on – tangy yet sweet. Kudos to Chef Tanya for designing an affordable, extensive menu that’s mostly devoid of fried food. In addition to the Saigon Roll, my friends and I feasted on a variety of vegetable-laden dishes such as the Rockin’ Moroccan Bowl, the Ensalada Azteca, and the Bangkok Curry Bowl. Portion sizes are generous and not a single item is priced over $9.95. 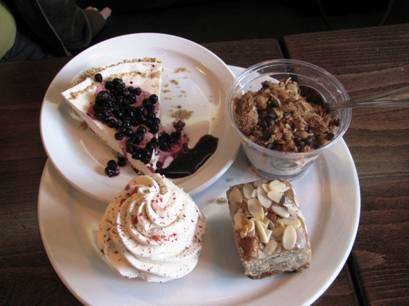 Desserts, priced at $2.95, are all vegan and sweetened with agave and/or maple syrup. After sampling a boogie bar, a peanut butter parfait, a cardamom rose cupcake, and a piece of cheesecake, we all agreed that the peanut butter parfait, a creamy peanut butter mousse layered between pieces of boogie bar (banana bread packed with almonds, oats, coconut, and chocolate chips), took the cake (as it were). The combination of the creamy and crunchy textures along with the flavors of peanut butter, banana, and chocolate make for an outstanding treat. 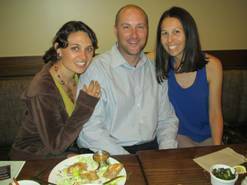 Thanks to the folks at Native Foods for hosting a fun pre-opening party for members of the local community. My friends and I enjoyed the wholesome food, the opportunity to schmooze with other locals, and meet the personable, hospitable manager, Steve, who is bringing HEALTHY back! Welcome to Boulder, Native Foods. I am delighted to have a new, fast-casual, plant-based restaurant in town. Native Foods is located in 29th St. Mall. Previous Previous post: Don’t Dis The Doughnut!